Recently I finished (in so much as any software I develop is actually ever finished) a tool that allows bulk jACT-R model runs to be submitted to a remote server. All in all, it was an amazingly painless experience made possible by ECF, a protocol neutral communications library in the latest release of Eclipse. To be completely honest, while I’ve had dreams about this tool for a long time, it wasn’t until I saw the webinar for ECF that I realized just how feasible this project was. Before I present my gripes, let me just say that the folks behind this project have done an awesome job. It took about a week to get this whole tool up and running. But there were some headaches, mostly due to documentation (availability, when it’s there it’s good) and mental model mismatches. It’s always nice to hear fellow developers out there adopting your work and generally being happy with it. For the documentation problem, rumor on the street is that an ECF book will be started soon so that is good news for people craving more documentation. I’m so filled with joy that ECF 1.0.2 was just released last night. To grab it, go to the downloads page or point to the update site. The release contains quite a few fixes, but I have to admit, a lot of the fun stuff will be coming in 1.1 🙂 Thanks to all the participants in BugDay that helped out, a good portion of the fixes in this release came from BugDay. It was really great to see the Eclipse community support the project with contributions in the form of bug fixes and ideas. If you want to see anything in particular, let us know and we’ll try to accommodate! Never fear though, PDE was there for me like always with a new template for the 3.3 edition. After looking at the code generated by the template, I had a better idea of how to work with the new command and menu story. 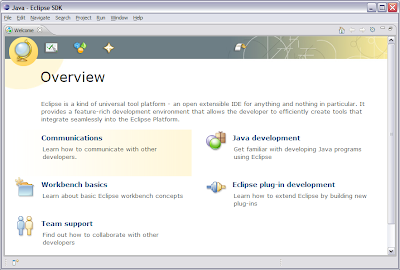 The trickiest part was the locationURI attribute on the org.eclipse.ui.menus extension point. For the menu entry (pictured above), the locationURI was menu:navigate?after=open.ext3, which means insert me into the navigate menu (see IWorkbenchActionConstants for valid identifiers) after the open.ext3 group. 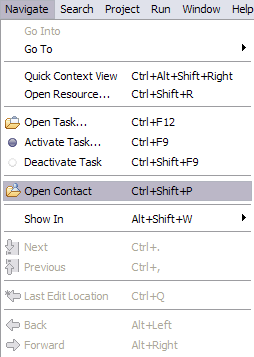 For the toolbar entry, the locationURI was different, toolbar:org.eclipse.ui.main.toolbar?after=additions. That wasn’t too bad right :)? On a side note, as part of my “not to gain a ton of weight while working in the software industry” diet, I like to bike about ~100 miles (~160 km) a week. 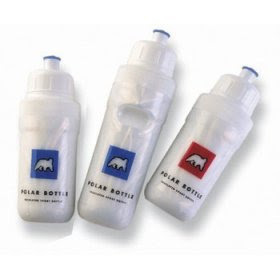 In the Texas summer heat (100F / 37C), nothing is more precious than cold water for me 🙂 These new polar insulated water bottles seem to do a really good job keeping the water cold for a typical 2-3 hour ride in high heat. 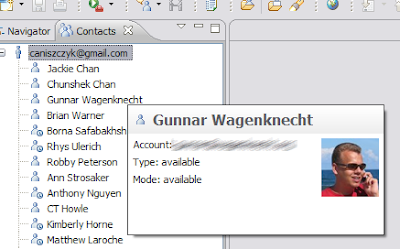 On the plane to Boston, I managed to fairly quickly implement something I’ve wanted in a messaging client for years, the ability to quickly browse and message a contact via a keybinding to prevent the usage of the mouse (similar to how Ctrl+Shift+T in Eclipse rocks). 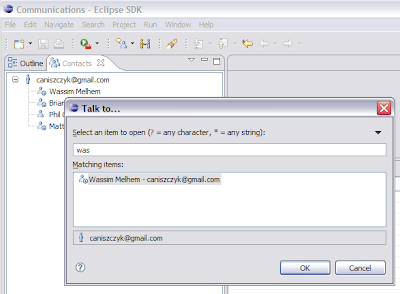 I implemented this feature for ECF (which is becoming my main chat client since it’s nice to have it all within Eclipse). How did I do this? Well, I used the wonderful FilteredItemsSelectionDialog from the Platform. And by wonderful, I mean it was wonderful once I got everything working 😀 I then took advantage of the new Platform Command Framework to wire things together (there was a PDE template that helped me with this). 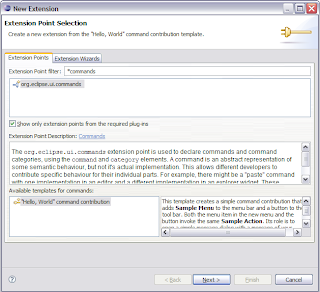 Look for this functionality post 1.0 ECF. I encourage people to file bugs and feature enhancements against ECF to make it more fully-featured. That zany UA team was at it again with a new feature for Eclipse 3.3 which I think Eclipse projects should take advantage of. The feature provides you a way to introduce your project to a user when the project is installed say via an update site. A good example of this is what I’ve done with ECF. Basically when ECF gets installed, you get the welcome framework notifying you that a new “feature” has been installed by highlighting a relevant welcome entry. It would be nice if all projects part of the Europa release would do this (however, this now raises the question whether we need some coordination between projects to be more careful about the wording that goes on the welcome page). Mylar? CDT? TPTP? Who is in? Also, notice that the ECF welcome entry is missing a beautiful icon. It would be great if someone in the community would donate some of their time and provide a welcome icon. That would be fantastic and I would owe that person a frosty beverage, please use this bug as a point of submission (if you want to create more icons, here’s another bug, you’ll save Russia from blindness if you do ;p).